A person should continuously look for ways to develop his or her skills, abilities, and competencies to enhance his or her performance. Through effective skill enhancement, you become more capable, competent, and confident in yourself and your performance, and are better able to reach your goals. A skill Enhancement Plan is essential for consciously improving your skills and is most effective when it is connected to your goals. Therefore, you should first set your goals then determine which skills need to be addressed in order to reach those goals. By linking skill enhancement to long-term goals, you will help ensure the motivation and desire is there to build that skill. Interpersonal Skills focuses on relationships and interactions with others. It includes how to communicate and work with others, as well as how to lead others. 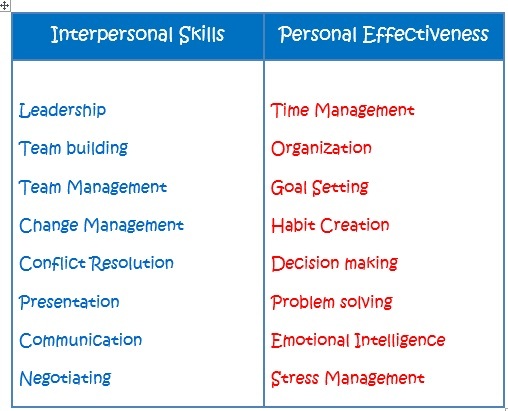 Personal Effectiveness centers on skills that can be applied independent of other people. It includes skills such as goal setting, problem solving, time management, and stress management. Both sections hones in on specific skills such as leadership, team building, time management, decision making, problem solving, and change management. Each skill has it own section with information designed to guide the learner and provide insight into enhancing that particular skill. Our Personal Effectiveness Series centers on skills that can be applied independent of other people. These are skills designed to enhance a person’s overall effectiveness at performing tasks, but can develop without the dependency of others. Personal Effectiveness skills are essential to personal growth and for successful performances. They are not isolated to independent performance. Whether a person is performing independently or on a team they need to have a strong set of personal skills. Our Personal Effectiveness series is designed to provide strategies and give insight into behaviors and attitudes that can help an individual organize tasks, manage time, and manage themselves. These personal effectiveness skills include personal goal setting, time management, problem solving, and emotional intelligence. Interpersonal Skills are those abilities, attitudes, and competencies centered on relationships and interactions with other people. These skills can enhance a person’s ability to communicate with, understand, and motivate both individuals and groups. Interpersonal skills are becoming more and more a necessity in business, sports and education. Development of the interpersonal skills is a key goal of many business and team initiatives. Good interpersonal skills are often a prerequisite for many positions in an organization. Through our Interpersonal Skill Builder, we provide strategies and insight that can enhance a person’s ability effectively create behaviors that can influence and motivate with others. Our series include such skills as Leadership, team building, Change Management, and Conflict Resolution.